The 2nd Battalion, 5th Marines was initially formed in July 1914 and immediately sailed to the Caribbean due to political turmoil in the Dominican Republic and Haiti. The battalion returned to the United States in late 1914. In June 1917, the battalion sailed for France with its present regiment. During World War I, the battalion participated in the Battle of Belleau Wood, Soisson, and the Meuse-Argonne Campaign. For these actions, the battalion was twice awarded the French Croix de Guerre with Palm and once with Gold Star. The FOURRAGERE, representing these awards, and is worn today by members of the battalion. 2nd Battalion, 5th Marines participated in the post-war occupation of Germany and returned to the United States in August 1919. In 1920, at Quantico, Virginia, the battalion was ordered to guard U.S. mail trains. During this period, it also participated in reenactments of Civil War battles. The battalion was sent to Nicaragua in 1927 to fight bandits and supervised the 1928 national elections there. At Quantico from 1934 on, the battalion participated in numerous exercises contributing to the development of the Marine Corps Amphibious Doctrine. 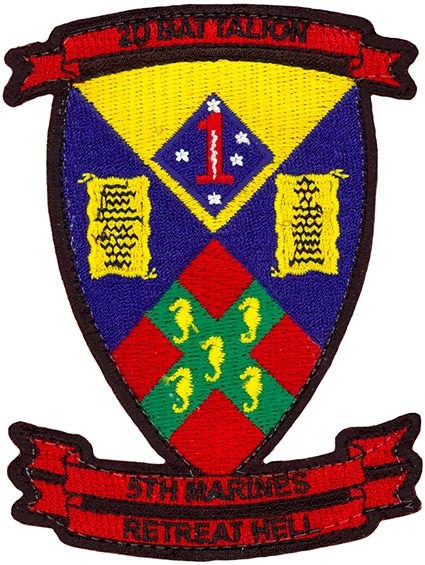 In 1941 2nd Battalion 5th Marines joined the newly formed 1st Marine Division at New River, North Carolina. The 1st Marine Division departed the East Coast in 1942 and has never returned. During World War II, that battalion fought at Guadalcanal, Cape Gloucester, Peleliu, and Okinawa. After the war, the battalion served on occupation duty in North China until 1947. In July 1950, 2nd Battalion, 5th Marines sailed from Camp Pendleton, California, to Pusan, Korea. In August, the battalion fought at the Pusan Perimeter. The battalion participated in the landing at Inchon, the liberation of Seoul, the Chosin Reservoir Campaign, and the defense of the East Central and Western Fronts. From July 1953 to February 1955, 2nd Battalion, 5th Marines assisted in the defense of the Korean de-militarized zone after which it returned to Camp Pendleton. In 1959, the battalion deployed to Camp Schwab, Okinawa, and then in 1960, relocated to Camp Pendleton. In April 1966, the battalion deployed to the Republic of Vietnam. During the next five years the battalion participated in combat operations in Hue city, Que Son, Phu Bai, Dong Ha and Phu Loc. The battalion returned to Camp Pendleton in 1971, and in 1975 participated in Operation New Arrival, the relocation of Southeast Asian Refugees. During the next fifteen years, the battalion deployed regularly as part of the Marine Corps Unit Deployment Program. In December 1990, 2nd Battalion, 5th Marines sailed for the Persian Gulf and participated in Operations Desert Shield and Desert Storm. 2nd Battalion, 5th Marines landed in Saudi Arabia and participated in the liberation of Kuwait. During the return transit to the United States, the battalion was diverted to Bangladesh in order to provide humanitarian relief as part of Operation Sea Angel. In 1993, 2nd Battalion, 5th Marines deployed as the Battalion Landing Team for the 11th Marine Expeditionary Unit (Special Operation Capable) and participated in operations in Rwanda and Somalia. In 1995 the Battalion began regular deployments to Okinawa for service as the Battalion Landing Team for the 31st Marine Expeditionary Unit (Special Operations Capable) and participated in several operations in East Timor. In February 2003, the Battalion deployed to Kuwait as part of Operation Enduring Freedom. In March, the Battalion attacked into Iraq, freed the Iraqi people and conducted peacekeeping operations in Muthanna Province until its redeployment in August. The Battalion earned its 14th Presidential Unit Citation for the Operation Iraqi Freedom campaign. In August of 2004, the Battalion once again deployed to Iraq to participate in Operation Iraqi Freedom II in Ar Ramadi, Iraq.